French polar explorer and adventurer Vincent Colliard is the co-founder of Ice Legacy, a project that involves skiing unsupported across the 20 largest ice caps on the planet over the course of the next 15 years. The aim of the project is to raise awareness of how climate change is negatively impacting earth’s polar ecosystems and encourage conservation initiatives. Since launching Ice Legacy with expedition partner Borge Ousland, the accomplished Norwegian polar explorer, in 2014, Vincent has successfully crossed five ice caps. His interactions with nature and the environment on these adventures have highlighted how climate change is destroying the world’s polar regions and that immediate action needs to be taken before it is too late. When did you make the decision to try and make a living from adventure? I was studying marketing but sitting in the class room listening to my teachers I would think to myself this is not where I belong. Going on expeditions was a passion but something I did in my holidays and every time I returned from an adventure, I had this fire burning inside me to plan another. As a child I was fascinated by the epic polar adventures of Amundsen, Nansen, Scott and Shackleton. I found these stories of human endurance really inspiring and, growing up in the Basque country, the polar regions felt so remote and inaccessible. After reading a book that mentioned Norwegian polar explorer Borge Ousland, I became determined to meet him and plan a polar expedition. Eventually I had the opportunity to join Borge on an expedition which involved sailing around the North Pole. When I returned, I saw that there might be a way to partner with sponsors and make a modest living from adventure. What is it specifically about polar environments you find so inspiring? Polar regions are one of the few places on the planet where there are no human footprints. For instance, last summer I spent 83 days on the Arctic Ocean trying to cross from Alaska to Spitsbergen. We didn’t succeed but in the 83 days we were out there, we didn’t encounter another human. I really enjoy the silence and that you become one with nature and feel like a wild animal. All of us have this hunter instinct but modern society is taking it away from us. Polar expeditions are a simple life, walk in the day, pitch camp, and melt ice, there are no messages, ads, or commercials disturbing your mind. When we are back home sitting in front of the computer it is taking us away from who we really are deep inside. Was there a specific moment on an expedition that inspired you to create Ice Legacy? In September 2010 Borge and I were attempting to sail through the Northwest passage which involved passing through the Bellot Strait, a narrow passage usually filled with ice. However, when we arrived the ice was gone. A polar bear appeared on the shore 15 metres from us. I clearly remember making eye contact with him and feeling guilty. With no ice his hunting ground was gone. This would be the same as if one day all of our supermarkets were empty. A century ago it took Norwegian explorer Roald Amundsen three years to cross the Northwest Passage, it took us just 25 days. Another important moment was when I saw a polar bear in Spitsbergen walking along the shore, scavenging for sea weed. His diet is seals but because there was no ice he had to eat seaweed. After these experiences, I thought something has to be done to highlight how fragile polar ecosystems are. As polar explorers, we have a unique set of skills. A hundred years ago, I would have loved to have been one of those first explorers discovering our polar regions, but that time has passed. It is now time to use our expeditions to help protect these ecosystems. Hopefully Ice Legacy can be a small inspiration for people and encourage them to think about climate change and how their daily habits can make a difference. What do you think about when you are on expedition in remote polar environments? Fortunate that I have the opportunity to spend time in such a unique untouched playground and inspired to do what I can to share how fragile these places are. We have a responsibility to protect wild places and it is not only ice caps that are beautiful. I am a very keen fly fisher and was recently on a trip with a friend who is an ecologist. We were standing in the river fishing for rainbow trout and found them swimming behind salmon eating their eggs. My friend told me it is amazing to be in the middle of a virgin ecosystem; when that salmon is going to spawn, the bear will come and catch the salmon. The bear will then leave the salmon carcass on the embankment which will decompose in the ground and feed the roots of the tree. The tree will produce healthy leaves which the moose will eat. When the leaves fall, insects will eat the organic nutrients on the leaves and then the same insect will be eaten by the rainbow trout. Standing in the middle of the river, I was thinking isn’t it beautiful, isn’t nature so well made. It is so perfect, it is time to do something about protecting it. There is clearly an element of risk and danger to your expeditions, how do you keep going when your head is telling you turn back? You need the correct mind set, it is important to keep calm. 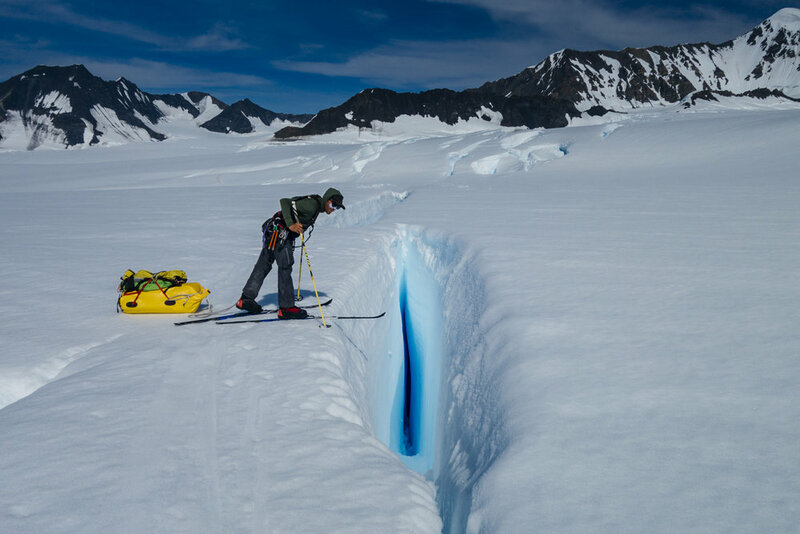 If there is a crevasse and you panic, you increase the chances of making a mistake and ending up in a bad situation. For instance, on an expedition last year, Borge went through two crevasses within three hours. I was shocked and scared but had to slow down, keep calm, and apply my training to make sure the rope was still under tension and Borge wasn’t going any deeper. It is the same as a polar bear encounter, if you freak out, turn around and run you are increasing your chances of being attacked. It is important to stand your ground and have a relationship of predator to predator as much as you can. When you are opposite a polar bear he is top of the food chain, and under him is prey; if we show him our back we are sending a signal that we are afraid, so the situation could easily get much worse. It took me many years to have this mindset. I spent time diving with Tiger sharks in French Polynesia for example trying to push these emotional boundaries as much as I could and feel comfortable in potentially dangerous situations. What will be the next chapter for the Ice Legacy project? We are hoping to establish a strong scientific collaboration with a polar institute or university. We would love to take samples from all the future glaciers we are going to cross for the scientific community to analyse. We are also looking to cut our carbon footprint by sailing from Norway to Iceland rather than flying to cross our next ice cap, the Vatnajokul. Which ice caps do you anticipate will be the hardest expeditions? Icecaps are harder than others for various reasons; we want to go to Russia but can’t get permission, Borge has tried for the past five years. Pakistan will also be difficult because of the big mountains. The Chugach ice cap in Alaska we just crossed was really tough, so I am glad that is off the list!